Kaizen Factor | Spotted: Mystery Lexus RC 350 in Ultrasonic Blue!? Spotted: Mystery Lexus RC 350 in Ultrasonic Blue!? Home / Brands / Lexus / F SPORT / Spotted: Mystery Lexus RC 350 in Ultrasonic Blue!? 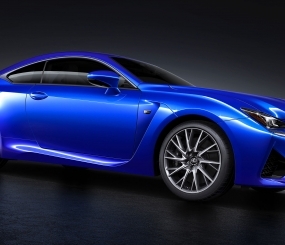 2015 Lexus RC 350 in Ultrasonic Blue Mica? Some photos of a new 2015 Lexus RC 350 surfaces from an unknown source in Ultrasonic Blue Mica. At first glance it looks like the 2015 RC F which recently debuted in Detroit last month, but that particular car and the RC 350 in red are currently on display at the Chicago Auto Show. This mystery RC 350 which was spotted in Southern California yesterday sporting Michigan manufacturer plates. The car is a bit confusing as it has the qualities of an F SPORT model because of the color, but it has some quirky features highlighted below. Is this a test mule of the RC F disguised as a regular RC 350? Perhaps this is a preview of a future RC 350 F SPORT? Lexus has not announced an F SPORT model for the RC, but it’s probable we may hear something at next month’s Geneva Motor Show. This appears to be a prototype Lexus RC 350 tester, note the Michigan manufacturer plates. Check out the split 10-spoke wheel finished in a brushed aluminum and graphite. 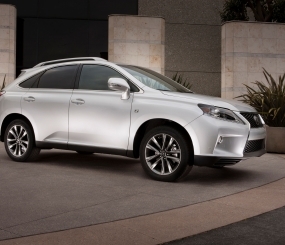 It also has park assist sensors on the bumper and fixed headlamp washers like the LFA and 2014 IS. The oddity of this car is that it has a has a standard waterfall grille but it does have openings on the spindle grille for fog lights! I hate to burst your bubble, but I think all that we’re seeing here is a second regular RC 350 pre-production prototype that just happens to be in Ultrasonic Blue II and featuring an alternate wheel design. Although Ultrasonic Blue has been F Sport and F exclusive in the IS line, that hasn’t been the case for the IS C, which the RC line will eventually replace. 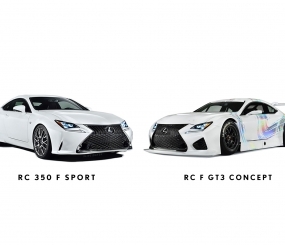 And I heard at the Detroit Auto Show that, at least in Japan, RC F would offer 3 different wheel designs options, so it’s perfectly conceivable that RC 350 might offer a couple of options.